The day started with us finding some info on the MSI S20 Slider Ultrabook. We’ve seen designs similar to this before in the UMPC and Netbook world but never with a full desktop-capable platform inside. Later in the day we tracked down a presentation video. In the presentation video we heard that the S20 was ‘under 2kg’, but MSI officially says that it’s 1.3kg which is more acceptable for tablet use. Update: Golem.de has some new photos! The Computex press events started with the surprise Acer Aspire S7 11” and Acer Aspire S7 13” Based on Ivy bridge and coming in at an almost impossible 12.5mm thick these two seemed to impress and not just because we rarely see Acer leading with design. Glass lid and back-lit keyboards feature along with a claimed battery life of ‘up to’ 12 hours for the 13.3” Aspire S7. The 11.6” Acer Aspire S7 makes netbooks look old, fat and clunky. Following up the Aspire S7 was something a little more down to earth. Sony have officially launched their second-generation Ultrabook in the USA. Starting at $769 for Ivy Bridge! This is a welcome move. We took a short break to review the Acer press releases and considered the Intel Atom-based ‘transformer’ style Acer Iconia Tab W510 for mobile work but we suspect you’ll be moving quickly past that if you’re hooked on mobile desktop power. The Iconia Tab W700 might be more interesting as it’s a ‘raw’ tablet based on Ivy Bridge and running Windows 8. We’ll revisit these Ultraslates in the near future. 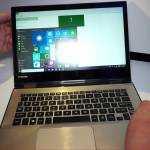 The Keyword ‘TaiChi’ has been offered up by ASUS in the days before Computex so it was with more than a little excitement that we got the first pic of the ASUS Taichi through and heard it was a Windows 8 Ultrabook. When we heard, and then saw, that it had a screen on both the front and the back of the lid, we knew ASUS had done it again. Their design team is always coming up with new ideas and this is a potentially great one as it reduces the engineering needed for convertible hinges. Can you imagine the fun you’ll have with this in the local café? Dads will now be able to work while their kids sit across the table from them and watch Postman Pat. Or perhaps there’s a productive reason for the dual screens! We need to talk about this in depth very soon. (Your comments welcome.) A set of ASUS TaiChi videos are available here. Remember this. These are all showcase devices that may or may not get to market. All of them appear to be working and well developed so there’s hope but anything could happen between now and when Windows 8 launches. That’s why we’re not seeing full specs and not seeing prices. In fact, on Day 0 we barely saw a single ‘mainstream’ Ultrabook. It looks like we’ve uncovered something though. 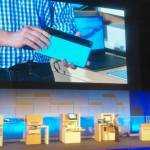 The ASUS Series S Ultrabooks are shown in a video but we can’t, as yet, find any detailed information. If you’re interested in gaming and multimedia, video editing or music, take a closer look. Expect specifications tomorrow when we’re likely to see the manufacturers get back to the business of todays sales when they launch back-to-school Ultrabooks. Lenovo have already put the U310 and U410 out there but there’s more to go. Watch out for announcement from Dell, Fujitsu, Toshiba, Acer (we’re waiting for the S5 remember) and the others, even if their devices have already leaked. We’ve got 20 Ivy Bridge Ultrabooks in the list now. And finally, to prove I was keeping in touch with the voice on the floor over in Taipei, here’s a little Google Plus hangout we did earlier with Netbooknews who are based out of Taiwan. Stay with us as we clean up after day one and add links and information into the database. We’ll be tracking Day 1 live again tomorrow. Intel’s push for Ultrabooks are finally looking to make a difference. 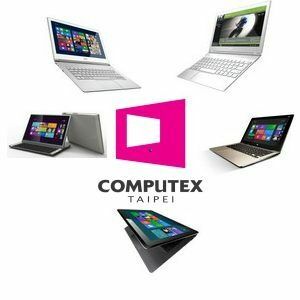 Though this is the result of industry collaboration, which includes Microsoft, Intel, Asus, and many others. Regardless of whether there are disagreements(agreements) over form factors of convertibles and hybrids, the innovation can only be good for the industry. 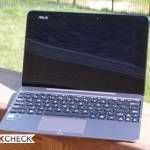 I see 2nd Generation Ultrabooks as not being just based on Ivy Bridge, but bringing new and exciting form factors. The push towards premium features like Touch and NFC helps to push prices lower for those that don’t require such features. That can only help everyone.